SABIC’s Innovative Plastics business is marking continued progress in the adoption of its polycarbonate (PC) glazing materials for automotive window applications with Fiat’s new 500L multi-purpose vehicle (MPV), which features rear fixed side windows molded from SABIC’s clear LEXAN™ GLX resin and black CYCOLOY™ resin. These high-performance SABIC materials help reduce weight by about 35 percent, improve aerodynamic efficiency and achieve the desired styling vs. glass. 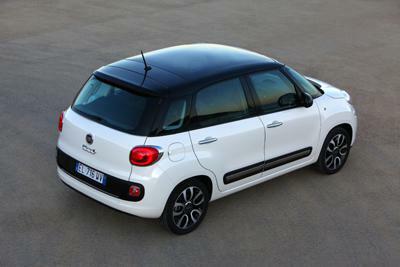 The Fiat 500L has already launched in Europe and is set to roll out in the United States in early 2013. The rear fixed side windows of the vehicle will be the first in the United States to use two-shot injection compression molding, which allows for the seamless integration of an aerodynamic spoiler. The Fiat 500L windows demonstrate the enabling power of SABIC’s PC glazing materials, the practical application of PC glazing in today’s mass production vehicles and the continued traction of PC glazing in the automotive industry. SABIC’s glazing materials help reduce the weight of Fiat’s rear fixed side windows by about 35 percent compared to glass, helping the automaker advance its fuel efficiency and emissions reduction goals for the new model. “Polycarbonate glazing technology and resins are production-ready and are increasingly being adopted by forward-looking automakers like Fiat, and we are pleased to have collaborated with our valued customer on this next chapter of the iconic 500 vehicle series,” said V. Umamaheswaran (UV), SABIC director of marketing, Automotive, Innovative Plastics. “Polycarbonate glazing is a cutting-edge technology that is viable and available now for automakers. They can use these materials today on their mass-market vehicles to cut weight by up to 50 percent for some parts and, as we see with the Fiat 500L, add value in the flexibility of design and help improve aerodynamics as well. SABIC’s glazing materials enabled Fiat to overcome the key challenges involved in designing a rear fixed side window adjacent to an aerodynamic spoiler, including gaps between the two parts, different color tones and assembly issues. Integration of the rear fixed side window with the spoiler, made possible with SABIC’s PC glazing materials, addressed each of these challenges. The window uses two-shot injection compression molding to create a seamless part. The crystal clarity of LEXAN GLX resin provides optimal visibility. The black CYCOLOY XCM resin serves as a fade-out band, presents uniform color across the window and spoiler, provides structural functions and contributes to superior dimensional stability in combination with LEXAN GLX resin. To help create this part, SABIC collaborated with Fiat and provided a range of technical expertise, including predictive engineering. The LEXAN GLX grade, a specialty PC resin, was developed with automotive glazing applications in mind. It delivers high cleanliness, weatherability, easy processing and compatibility with protective coatings. The CYCOLOY grade, a blend of PC and acrylonitrile-butadiene-styrene (ABS) resin, provides superior dimensional stability and excellent aesthetics for this application.